Next: Senator Hatch's Office Claims Missing Amendment "Just a Coincidence"
Blog Update (5:25 PM): Senator Hatch's Office Claims Missing Amendment "Just a Coincidence"
Just when you think you've seen the ultimate in hypocrisy, that perhaps it's impossible to become further depressed by politicians and their duplicitous antics, out pops another example that digs the pit ever deeper into the muck. Utah Senator Orrin Hatch provides today's painful example. A GOP Senate member since 1976, Hatch at one time seemed extremely conservative. With some in the Republican party now rushing so far to the right that they're leaving gamma rays in their wake, Hatch seems considerably more moderate now by comparison. This is a dilemma for Hatch, especially with Tea Party and other assorted right-wing wackos out for his political blood. Now it appears that Hatch has tried to delete a significant piece of his own history in a calculated (but incredibly inept) attempt to mollify the "birther" constituency -- and Google has helped to provide the evidence. By now you know all about the birthers and their nutty claims about President Obama. As I long predicted, even the presentation of Obama's long-form birth certificate has not quieted these fanatics. Like the folks who insist the U.S. dynamited the World Trade Center, or that computers can predict the future by playing "bible code" crossword puzzle games with Old Testament texts, the birthers live in their own special world of dreams, immune to logic or reality. Hatch wants to keep his job -- and the birthers present a serious problem for him. You see, back only eight years ago, when Austrian-born Arnold Schwarzenegger (for all his faults, still a quite moderate, non-wacko guy) was in his ascendancy with the GOP, Hatch proposed a constitutional amendment -- the "Equal Opportunity to Govern Amendment" ["Presidential Eligibility Amendment"] -- to allow persons born abroad (like Schwarzenegger) to become president! This bit of history has become rather inconvenient for Hatch, when he needs to appeal to Tea Party and birther zealots. Hatch hasn't talked about his proposed amendment much recently, and he appears to be in the process of trying to perform a 1984 "Ministry of Truth" expunging of this particular aspect in his career. Apparently until a couple of days ago, the details of Hatch's proposed amendment were still available in the direct archives of his Web site, listed along with his other legislative efforts over the years. But there's a gap in that list of pages now, seemingly where mention of the amendment used to be present. 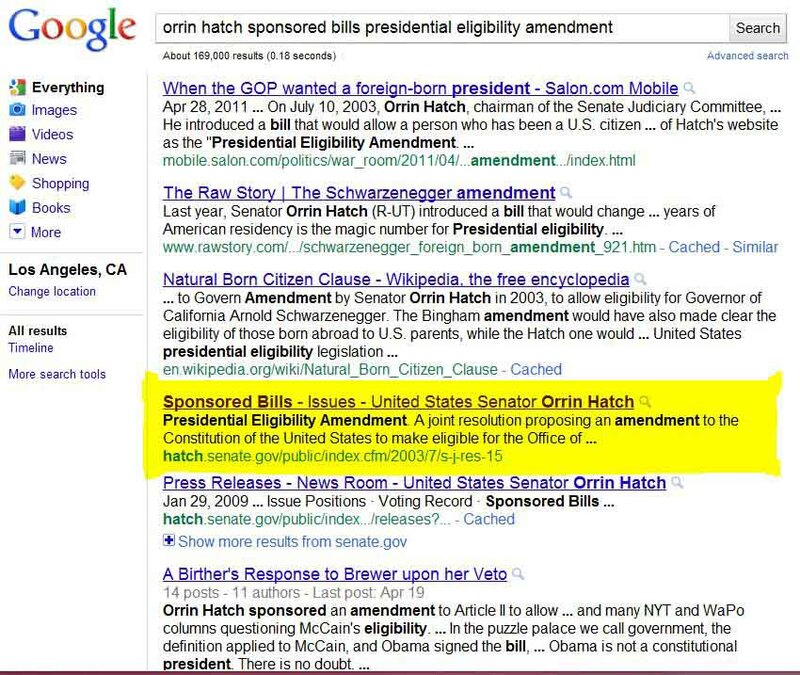 Right now as I type this, if you search on Google for this topic, you'll can still immediately and easily find the relevant reference to the amendment at Hatch's site -- and here is my copy of those search results. But what happens today when you follow the associated link back to the Hatch site itself? Wham! Bam! The link's flushed down the Can! Hmm. 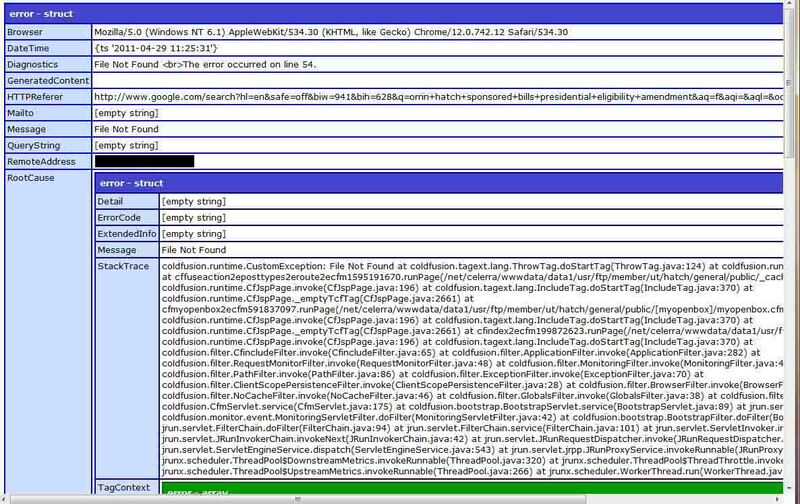 Rather than being shown a proud presentation of Hatch's legislative efforts on this subject, we're unceremoniously dumped onto a back-end ColdFusion error page triggered by a mysteriously missing file. Not very classy. Seriously sloppy in fact. And to what end? As I've said so many times before -- the Web has a very, very long memory. Trying to delete or block material from the Internet after it has already been made public is a "double whammy" losing proposition. You lose because copies of the information are almost certainly going to still be out there. And you lose again -- big time -- because the act of trying to delete or otherwise cover-up the embarrassing or otherwise unwanted data can so easily draw much more attention and scrutiny to the very topic that you wanted to bury -- as in this case. I've always felt that Orrin Hatch was a decent enough person, even though I've disagreed strongly with many of his political positions. It's disappointing in the extreme to see him trying -- unsuccessfully of course -- to run away from his own work in this manner. If you've changed your positions on a topic, that's fine -- honest evolution in thinking is nothing to be ashamed of -- quite the opposite in fact. It's stagnation that we really have to fear in so many cases. But trying to manipulate history in the Internet age is a fool's game. The Web giveth, and the Web can quite easily taketh away as well. Honesty remains the best policy. Even today. Especially today.